← beavers, prodigal brothers and hope. 5 reasons why you should blog. Exercise. I’m just not good at the discipline of it. However, I am good at exercising my mind. Writing does just that. It stretches my mind to put these thoughts down in a cohesive way. It takes time and practice to be grammatically correct. Catharsis. These words represent me. I’m a pretty serious person which explains why my blogs are pretty serious. I’m not very good at journaling my daily activities. I am good at letting things build up and then vomiting them back onto key and screen. Invitation. I’m not sure who reads these posts outside of those who respond in some way. It is however an invitation to respond in any way you see fit. It’s an invitation to laugh with me and cry with me. To share in the good and the bad. To love and to hate. Practice. The best way to write better is to write more. With coffee in hand and music in play, I’m ready to go. Connection. Perhaps the most important. You are important and your thoughts are important. What you say is important. You matter and we are all on this journey together. If you like to blog or write, I would love to hear why. I like your post and the pic…and agree with the five points. It’s also an escape for me. I’m in another world as I write. I may portray emotions and life events but not be bound by the circumstances and all of the “you oughts, you shoulds, you can’ts…” It’s also a ministry, a way to encourage others and to provide a safe place to go to examine those emotions we all have. Exactly. 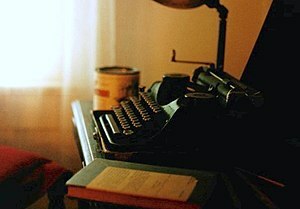 If writing were bound by circumstances of life and the “oughts…” then we may never truly get at the truth of a thing. “Examination” could have been a 6th point! Thank you for the feedback. Thank you! I think blogging thrives in the minutiae of life. It’s that obsession that drives us to write more.